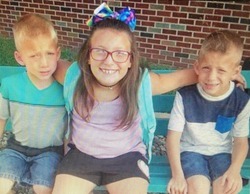 Miss Alivia Faith Stahl, 9, passed away with her twin brothers Masters Xzavier Patrick Ingle and Mason Thomas Ingle, on Tuesday, Oct. 30, 2018. This was a result of injuries sustained in a motor vehicle-pedestrian accident. On Dec. 22, 2008, Alivia Faith was born in Logansport. She was the second daughter of Michael and Brittany Schwab Stahl, joining her big sister Selena. Three years later the twins Xzavier and Mason arrived. Growing up up near the Tippecanoe River, northeast of Rochester, Alivia was a 4th grade student at the Mentone Elementary. She was a member of Mrs. Dye’s class and an All-A honor roll student. Alivia possessed a caring heart, encouraging her classmates to excel. She was happy, with her brown eyes twinkling and a warm smile, brightening the days of whomever she met. With an intense thirst for knowledge Alivia loved to read all kinds of books. She also liked to sing, especially karaoke. Proudly wearing # 14, Alivia had a passion for playing softball, always being in the midst of action on the ball diamond, playing second or third base. Late last week, her number 14 was retired by the league to honor her memory and enthusiasm for the sport. Alivia attended the Heartland Church in Winamac. Her favorite colors were purple and teal. She enjoyed dining experiences usually at home and sometimes eating out. Chili, meatloaf, and donuts were some of her favorite foods. She loved all babies, kittens, puppies and traveling. Alivia enjoyed the creativity of taking selfies, then sharing her images on snap chat. She had a fondness for emojis especially poop and donut emojis. Confident and proud of her beauty inside and outside, Alivia was known as her Dad’s Little Rapunzel for her beautiful auburn-brown hair with summer highlights that stylishly flowed beyond her shoulders. She looked forward to nightly chats with him. Paramount in her life was her family. She was also known as the “Mother Hen,” always watching over her little brothers and helping them with everything that she could. Many wonderful memories were made camping and at Turkey Run. Alivia was accomplished as a baker making tasty moist brownies and cookies. She is remembered for her great ability to give warm hugs. Cherishing Alivia’s memory are her parents: Brittany Stahl and fiancé Shane Ingle of Rochester, Michael and Mindi Stahl of Winamac; sister: Selena Stahl, step-sister: Nikki, step-brother: Matthew, grandparents, great-grandparents, aunts, uncles and cousins. Although her dash was abbreviated, Alivia’s life created a dynamic ripple effect, influencing all who knew her. Her memory will continue to live in the hearts of her family, friends, teammates and classmates who she met along life’s journey. Alivia’s family will receive friends from 4-8 p.m. on Friday, November 9th in the Good Family Funeral Home, 1200 West 18th Street Rochester. Private services are planned. Electronic expressions of sympathy may be made to their families at www.goodfamilyfh.com.